The NZXT Kraken X60 stands out with its impressive results. The performance of Corsair H100i Extreme at its maximum fan speed is just as good as the minimum speed rate of the Kraken X60’s fans. The same thing happens in the comparison with the Swiftech H220. It is just 1°C worse than its predecessor at 1870 RPM. As the speed rate of the Kraken X60 increases, so does its performance, so 60°C is the peak temperature of the hottest core in our overclocked six-core CPU. That result is phenomenal. The Kraken X60 is 6°C better than the X40, 7°C more efficient than Corsair H100i Extreme Performance, 5°C better than Swiftech H220 and even 9°C lower than the best air cooling system Phanteks PH-TC14PE when its fans reach their peak rate. The NZXT Kraken X60 performs even better with hotter CPU. 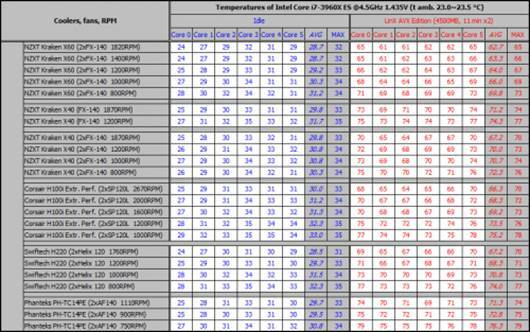 The Corsair H100i Extreme Performance struggles a lot to narrow the distance by 1°C, but the gap is still significant at 5°C. 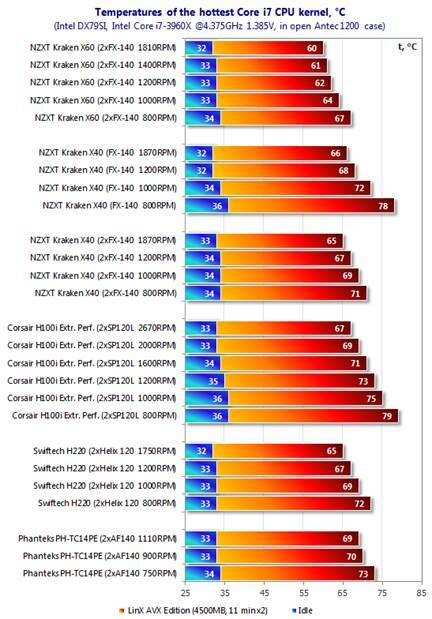 There are no changes in the difference between the Kraken X60 and the Swiftech H220, but the gaps have been enlarged to 9°C different when comparing to the NZXT Kraken X40 and Phanteks PH-TC14PE. The coolers are almost similar when their fans are at the lowest rate, but the Kraken X60 is still ahead by 3 to 6°C. Actually, that is not the best thing that Kraken X60 is capable of. 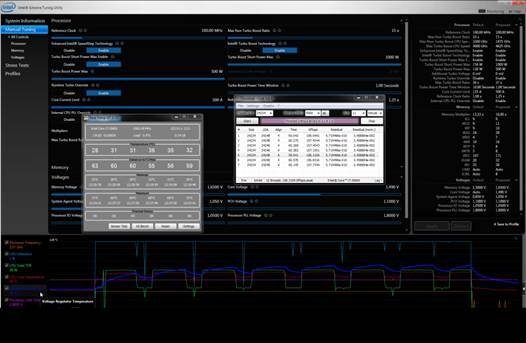 We tried to check it at the highest CPU frequency (4.625 GHz at 1.49V) and found out the fact that it is able to keep the CPU stable at 1000 RPM or 1820 RPM. 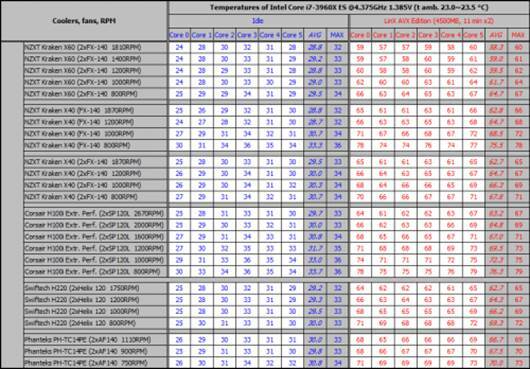 The peak temperature in the idle mode is 74°C and it reduces to 72°C at the highest fan speed. That is impressive enough although we just ran it on a half-open configuration. Now let’s check how noisy the Kraken X60. It has been expected that the Kraken X60 would be noisier with its two 140mm NZXT Kraken X60 fans than the Kraken X40 as it just has one single fan. Only the original Phanteks fans produce a lot of noise, the speed remains similar. On the other hand, at 850 RPM it seems that the two 140mm NZXT FX fans do not produce the noise themselves. 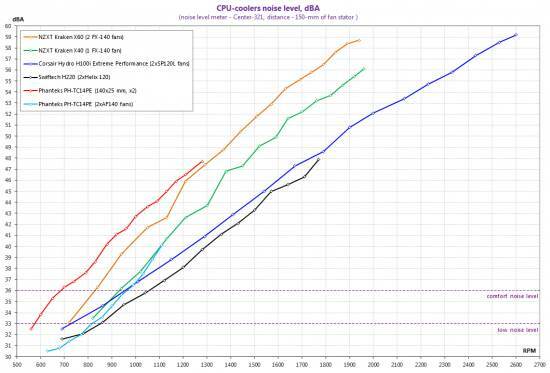 They are not uncomfortable then, and just like what we have learned above, for a 6 core SPU with activated Hyper-Threading at high frequency, this rate is enough to ensure efficient cooling. The pump of the Kraken X60 is obviously quiet. Swiftech H220 provides the most silent cooling system in this test. We think that the only drawback of the NZXT Kraken X60 is the limit in compatibility with computer cases which do not have enough space for its 240mm radiator. Otherwise, the Kraken X60 is the best liquid cooling system that is available, even when looking at its price. Supporting all modern CPU platforms and very easy to install, it is easily deployed even by unknowledgeable users. Its outstanding performance (for that class and that price) would be ideal for anyone who is the fan of overclocking. It is extremely silent at the lowest rate of fan and still remains that good performance as we have proved in the tests. And you can even attach four fans to it. The Kraken Control software is also worth being mentioned as it let the users monitor the key system parameters and adjust the speed of the fans as well as the color of water-block glow. Therefore, the NZXT Kraken X60 is a premium new-entry liquid cooling solution if you can find any computer platform that is compatible with it. It even provides a more than high performance to be considered as a new-entry level. That is why we recommend it for anyone who is interested in this kind of cooler. In short, we are so proud to title the NZXT Kraken X60 the Editor’s Choice as the best mass production liquid cooling system that is available.